The 2016 College Football season is right around the corner and that means prediction time. Below are five predictions for Conference USA for the 2016 season. Some predictions will be right, some predictions will be wrong, and some will be spectacularly awful by the end of the season. There are no changes to the teams in 2016 as all thirteen teams will be the same from 2015 with seven teams in East Division and six in the West Division. The seven East teams are Charlotte, Florida Atlantic, Florida International, Marshall, Middle Tennessee, Old Dominion, and Western Kentucky. The six West teams are Louisiana Tech, North Texas, Southern Mississippi, Rice, UTEP, and UT-San Antonio. 1. Rice will win the West Division – This will be either a spectacular pick or “what was I thinking pick?”. Rice has a total of 16 starters returning (7 on offense and 9 on defense), but will have to break in a new quarterback. The defense gave up 35.8 and 447 yards per game in 2015, but that was with only three starters back and that number triples this year, which should provide a vast improvement. Rice will have to navigate a tough conference schedule of Western Kentucky (on the road in week one), at Southern Miss, and at Louisiana Tech. Each team in the West has questions surrounding them going into 2016 and Rice has a solid chance of taking the division this season. 2. Old Dominion will make a bowl game – Should this prediction come true, it would be the first bowl in school history for Old Dominion. ODU played in the FCS between 2009 and 2013 while taking the step up to the FBS and C-USA in 2014. They went 6-6 in 2014 (were not bowl eligible) and then 5-7 last year. Last year’s team lost a lot of experience and had 7 starters back on offense with 5 on defense while the quarterback position lost both experience and time due to injury. 2016 should produce better numbers on both sides staring with offense. 9 are back on that side including the both quarterbacks, the top three running backs, and the top five receivers. They had 24.3 points and 371 yards per game in 2015 while those numbers should go up. The defense gave up 35.8 points and 437 yards per game, but will return 8 starters from last year while those numbers should go down. The schedule will be tricky with non conference games against Appalachian State and North Carolina State with those two both away from home. In conference, they have to deal with Western Kentucky (away), Marshall (home), Southern Miss (home), and Florida Atlantic (away). They can certainly reach six wins with games against Hampton, UTSA, Charlotte, UMass, UTEP, Florida International and a possible upset against the previously mentioned teams will go a long way to securing their first bowl bid. 3. Charlotte’s offense will top 25 points per game in 2016 – Charlotte is entering their fourth season of football with the first two played against weaker teams (FCS, DII, and DIII). 2015 was their first full season against the FBS and they had a rough time. They went 2-10, scored only 17.5 points per game, and gave up 36.3 points per game. This year, the 49ers return a total of 16 starters with nine on offense and seven on defense. The offense will add in the very talented quarterback Kevin Olsen from Miami (FL) and Robert Washington (originally committed to Syracuse) at running back while also returning the top four receivers from 2015. Speedy receiver Austin Duke led the team with 53 catches for 534 yards and 5 touchdowns. There are few reasons for this offensive unit to not hit 25 points per game in 2016 with the combination of talent and experience. 4. North Texas will finish with double digit losses – The North Texas program went south in a hurry. After going a school record 9-4 in 2013, the Mean Green fell to 4-8 in 2014 and even further in 2015 to 1-11. Dan McCarney was fired after Portland State laid a 66-7 beat down on North Texas in Denton. The offense sputtered averaging only 15.2 points and 320 yards per game while the defense was shredded giving up 41.3 points and 503 yards per game. The schedule is not kind to North Texas in 2016. They face SMU, Bethune-Cookman, Florida (away), and Army (away). It is not hard to envision a 1-3 non-conference finish for the Mean Green. In conference, their one winnable game in conference on paper looks to be Texas-San Antonio, but that game is away and UTSA should win it. I could be another 1-11 year or 2-10 if North Texas can pull an upset. 5. Middle Tennessee will finish no worse than 2nd in the East – The Blue Raiders of Middle Tennessee have a very good offense coming back in 2016. Brent Stockstill (pictured above and also the coach’s son) returns after throwing for 4,005 yards (66.7%) with 30 touchdowns and 9 interceptions as a freshman. Also returning are the two of the top three receivers for Stockstill. Richie James (108 catches for 1,346 yards and 8 touchdowns) and Terry Pettis (29 catches for 612 yards and 4 touchdowns) are those two receivers while three offensive linemen return. Coming into the mix is I’Tavius Mathers from Ole Miss at running back. For a unit that put up 34 points and 457 yards per contest in 2015, there should be no issues reaching those numbers again barring injuries. The trouble will be on defense and the schedule. 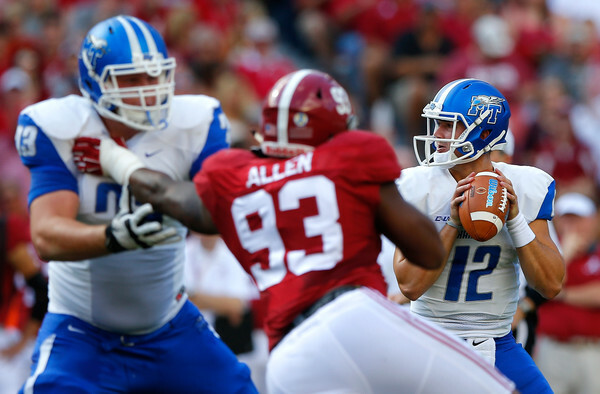 Defensively, MTSU returns five starters from the 2015 unit that allowed 26.6 points and 406 yards per game. With some high powered offenses that are in C-USA, that side of the ball will have to perform better. The schedule is not easy for MTSU as they face Western Kentucky (home), Marshall (away), and the potentially dangerous regular season finale against Florida Atlantic (home). Their benefit is they pulled North Texas and UT-San Antonio from the West, which should be two wins for the Blue Raiders. Going 2-1 against the three tough East teams should see MTSU finish second (or better if they go 3-0) in the East. With the C-USA predictions above, there are now predictions for three conferences in the books. Below are the predictions completed and which conference is next.